Life gets cluttered and messy sometimes. Standing on Ogden’s dock, almost ten years ago, looking out to the Atlantic, I was lost. My second marriage (don’t judge!) was tanking and I was drowning in self pity and confusion. I prayed for a sign, an omen, an enlightenment, a billboard! As I entered a little gift boutique, completely cluttered from floor to ceiling, my eye was immediately drawn to a little wooden sign. 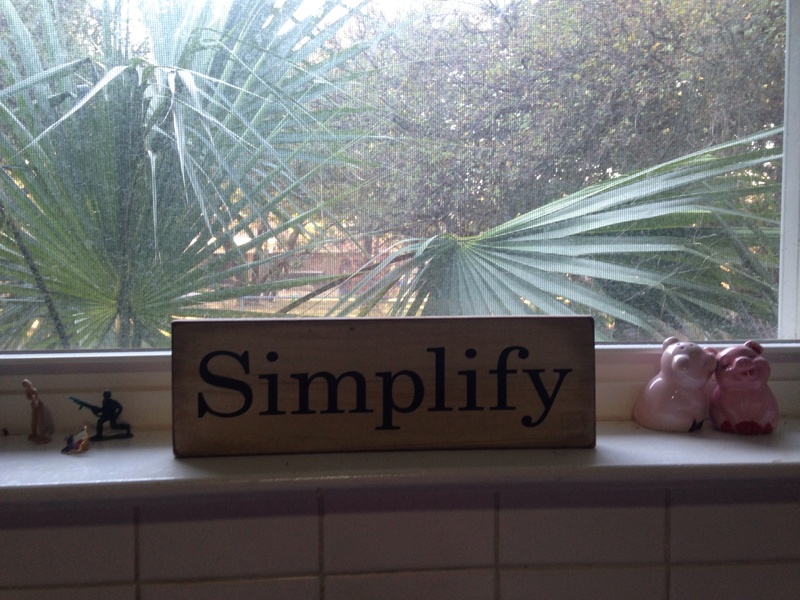 It simply said, “Simplify.” I almost fell to the floor. Wasn’t it just moments before that I has asked for a “sign?” I bought it, knowing it was My sign. Last weekend, while working with my family, we were cleaning out the clutter in my Gmaw’s house, I observed my Aunt and Uncle become overwhelmed. Toting boxes of stuff home to my own home of clutter and memorabilia, I again prayed for a “sign” to make sense of it all. And wouldn’t you know, sitting right there in the kitchen window of our single-wide was my sign. I hope you find your sign. Feel free to use mine. Your very Best friend in the whole wide world!